← Boris Nemtsov: Putin beat everyone – Russia, first and foremost. 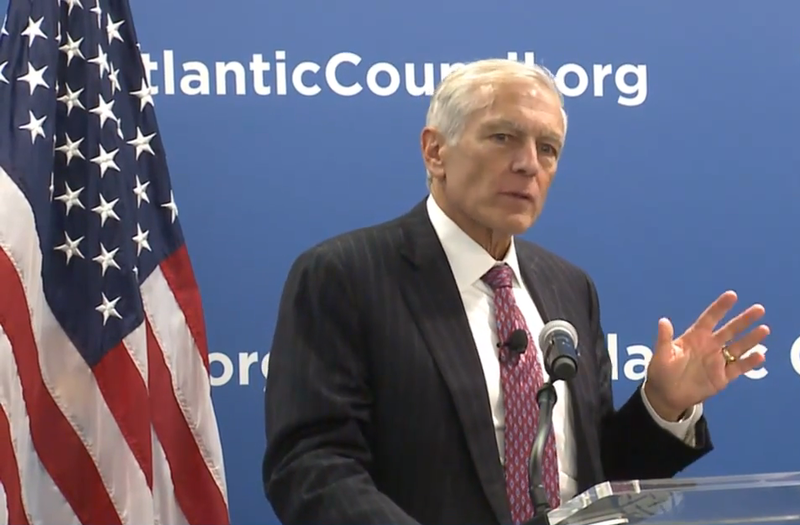 U.S. General Wesley Clark: Ukraine, Maidan and Putin (video). Retired General Wesley Clark, who served as NATO’s top officer, the Supreme Allied Commander in Europe, during a thirty-four year military career, visited the Atlantic Council on a tour to promote the book he released this week, titled Don’t Wait for the Next War: A Strategy for American Growth and Global Leadership. “We have to understand that what Putin thinks is a different shade from the way we think. Putin’s a geo-strategist, that’s the way they’re all trained. So, it’s like: ‘This country, is it my country or your country, cause if it’s your country I want it, if it’s my country I’m keeping it.’ And that’s the way they operate. I mean, he bemoans the loss of the Soviet Union, now as a geo-strategist, he has to look at China as a threat; and, it’s the greatest threat, he knows it. I mean, (give you an example of this) when I was in Kazakhstan, the Deputy Prime Minister or the #2 in China, Wen Jiabao, came to Kazakhstan in 2005 and he was meeting people, he went to a reception, and he said: ‘How many people are in this country?’ Well the answer was like 15 million, you know, Kazakhstan is like three times the size of Texas. And Wen Jiabao says in passing, ‘I pity them.’ Sure, because they’re right next door to China. So, Putin has to feel that. So if you were Putin and you’re a long term planner, what are you thinking? You’re thinking, ‘I’m gonna get my lunch eaten by China. The only way I can handle it myself is if I can be stronger. How do I get stronger? I gotta have Ukraine back. How do I get Ukraine back? I gotta pry it out of the hands of the West. He’s been doing this for years. He’s got control of the electricity grid, he’s got the gas, he’s got air defense, he’s got border security, he’s infiltrated the armed forces, the police, the governmental structure, he’s bought off the oligarchs. Everything was going pretty much ok, until those darn people got out on the Maidan square, and saw through it, and started protesting it, and it blew the whole plan. We thought these plans were about terrorists coming into the Soviet Union, or into Russia rather, but they aren’t. They’re about Russians creating terrorists. So, they actually played out the war plan against us in Ukraine. So they sent the Spetsnaz in, and they were the terrorists, then they sent the GRU [Russian intelligence and subversive groups] in to build the insurgency up, then they sent the regular forces in to control it, and, in their war games they always use a nuke to finish it off, they use nukes for de-escalation. In other words, what they say is, ‘Ok, if NATO starts to come in, what we’ll do is we’ll fire a couple of nukes off, maybe hit, well we’ll hit Norfolk, that’s a favorite target, and maybe Warsaw, and NATO will be shocked and jump back. Well, he actually ran through his war plan against Ukraine this summer. But, what he sees is, if he plays this right, in six months, if he plays it right, he’ll have Ukraine. He’ll have Bashar al-Assad in control of most of Syria thanks to U.S. air power, and he’ll have sanctions released because he’s been “good” in following through – it “hasn’t been his fault Ukraine collapsed.” He’ll have the 2 Mistral ships, he’ll be invited to the G20 Summit in Australia, and he’ll still have the Americans saying, ‘We have to have Russian help [video transmittal interrupted]. We’re in a political world, he’s in a geo-strategic world, and we look at him and say, ‘Oh, he can’t keep going, we’ve got sanctions against him. Yeah, he likes those sanctions, because what happens is the people that weren’t his friends say, ‘You’ve caused us problems. He says, ‘I will help you. I’ll give you money.’ He likes that, it gives him greater control. We saw Milosovec do the same thing in the Balkans. So, we know the sanctions, in some ways, they may hurt the economy, but they promote his control. And, we say, ‘He’s got big domestic problems.’ Yeah, he does; I mean these mothers don’t like their kids being killed in Ukraine. But, you know, if you use this correctly, it’s like the Chinese Hundred Flowers Campaign. So, let a hundred flowers bloom, let those who would object, object. And then [makes a scything motion with right hand as if chopping off the heads of a hundred flowers], they’ve identified themselves and you take them out. So, there’s an entirely different mindset that you have to understand when you’re working against Putin. Or, with China: different. This entry was posted in "Voices" in English, Analytics, English, Maidan Diary, Others, Video and tagged #RussiaInvadedUkraine, EuroMaidan, General Wesley Clark, Maidan, Putin, Ukraine. Bookmark the permalink.